Thai food is one of the most well known — and loved — of all Asian cuisines. It can be found in countries around the world, however nothing quite beats the authentic taste that can only be found in Thailand. While in Phuket make sure to take a Thai cooking class. After a morning stop at the local market for fresh ingredients its off to the kitchen to begin learning the tricks of the trade. And the best part? At the end of the day you get to indulge in all the decadent dishes you have made. If cooking isn’t your thing or you just want food without the wait, trust the locals. One of their favorite places — and mine now too — is Bentley’s Soup (or as it is known in Thai, โก้เบนซ์ เกาเหลาเลือดหมู). Not only is the food to die for but the restaurant is open until 2:30am, making it a perfect destination for those midnight munchies. Deciding what you want may be a bit difficult, as the menu is only in Thai, however, if all else fails, just point to what you want then get ready to leave full and happy. Watching a Muay Thai match on television is nowhere near as exciting as seeing one in real life. 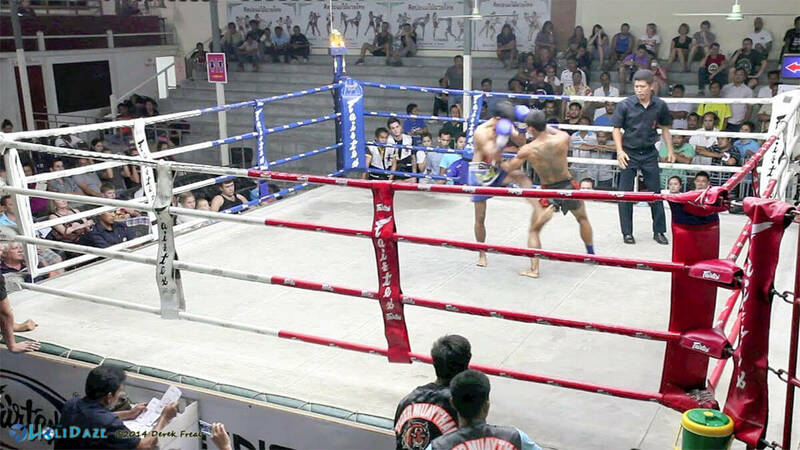 Kickboxing is Thailand’s preeminent sport and those guys really know how to fight. Unlike the often choreographed wrestling in the western world, Mauy Thai is known as “the art of eight limbs” and after witnessing a match firsthand you will understand why. There are matches every Friday night at Suwit Boxing Stadium, with the amateurs going first as they gradually work up to the main event. At 45 metres tall (nearly 150 feet) the marble mountaintop Big Buddha statue in Phuket is impossible to miss. It is one of the island’s most popular tourist attractions and a great spot for taking photos. For the best view of Phuket Town take a drive (or taxi) up to the Khao Rang Hill View Point. This is the perfect vantage point to practice your photography. Not only is the view spectacular but there are also several restaurants serving delicious food at great prices. It is also a popular destination for watching the sunset or indulging in a romantic dinner. Phuket Island is full of beautiful destinations and photogenic scenery. Even something as simple as the daily chores of locals can make for great photos. Don’t forget that famous Phuket sunset either! Be sure to spend a few hours wandering around with your camera and seeing what you can snap. What are some of your favorite things to do in and around Phuket? I love to visit the temple of gian buddha on the hill. After that I will go to have Kanom Jeen Nam Ya Poo (Crab). It’s my hot dish when I be there in Phuket. I will finish my day which sitting in nice scenery and watch the twilight of sunset. Sounds like a great time 🙂 When was the last time you were in Phuket?